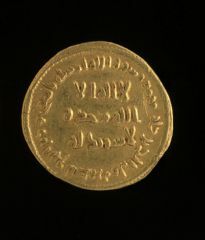 A gold coin, or dinar, with three lines of calligraphy on both sides, surrounded by a further band of calligraphy around the edge. The inscription in angular kufic script does not mention the name of the caliph or the mint; it gives the date and states the Islamic profession of faith, the Shahada. 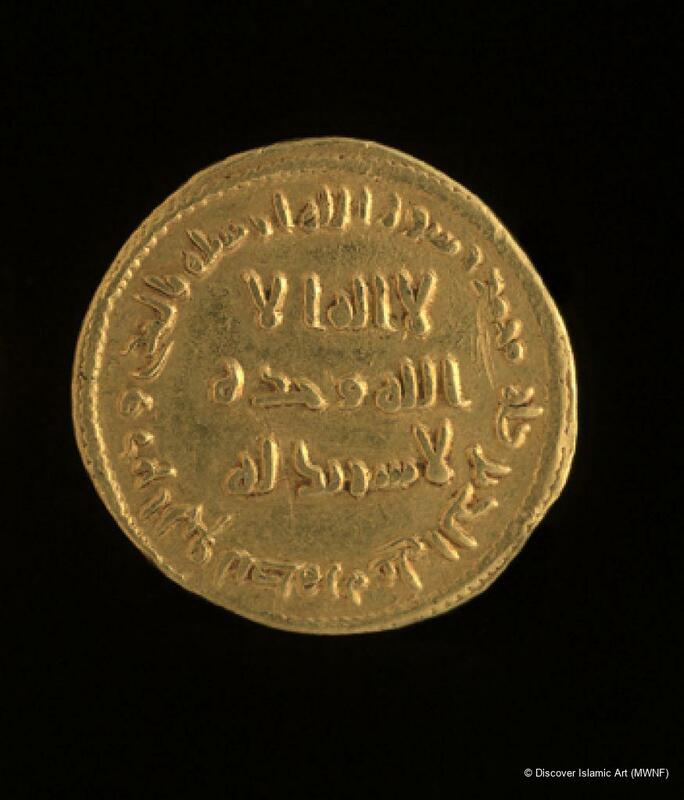 This coin is particularly important as it belongs to the first issue struck by the Umayyad Caliph Abd al-Malik (r. AH 65–87 / AD 685–706) in his coin reform of AH 76 / AD 696. 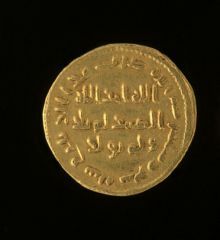 Coins had previously included figurative representations often derived from Byzantine prototypes, but in this new Islamic design the figure has been replaced with a calligraphic inscription, usually from the Qur’an. In addition to the changes in design there was also a new weight standard. Instead of the Byzantine 4.55 g the weight was adjusted to 4.25 g, known as the mithqal. Coinage continued to be minted without figural images almost without exception until the AH 7th/ AD 13th century. The prohibition of the figural is also seen in Umayyad religious buildings, such as the mosaics in the Great Mosque of Damascus (AH 87 / AD 706) that depict only buildings and trees. 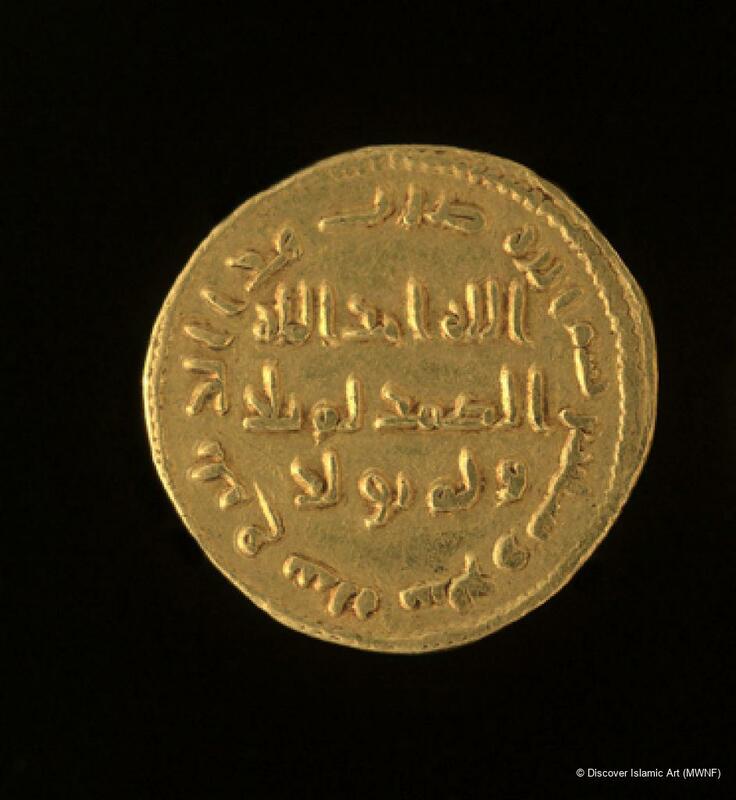 This coin is from the first issue stuck by the Umayyad Caliph ‘Abd al-Malik in his coin reform of AH 76 / AD 696. The new coinage featured calligraphy only, with no figurative representations. The text usually included words from the Qur’an alongside the name of the ruler. The coin is inscribed with the date AH 77 / AD 696–7. Gift of E. T. Rogers in 1874. The coin was probably minted at the political centre of the Umayyad dynasty, Syria, in the capital Damascus. Album, S., A Checklist of Islamic Coins (2nd edition), Santa Rosa, 1998, pp.20–21. Broome, M., A Handbook of Islamic Coins, London, 1985, chapter 1. Byzantine and Post-Reform Umaiyad Coins, London, 1956, p.84 ff. Walker, J., A Catalogue of the Muhammadan Coins in the British Museum, Vol. II: Arab-Byzantine and Post-Reform Umaiyad coins, London, 1956, p.84 ff. Williams (ed. ), Money: A History, London, 1997, p.90, fig.135.